Portland, ME - The Eastern League of Professional Baseball is pleased to announce that New Hampshire Fisher Cats catcher Travis d'Arnaud has been selected as the winner of the 2011 Eastern League Most Valuable Player Award. 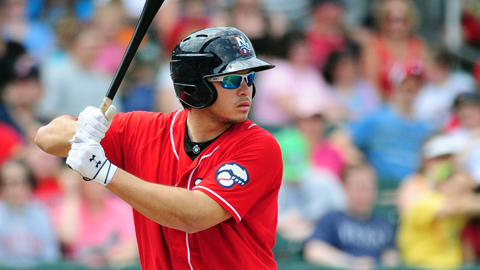 d'Arnaud is batting .317 (126-for-398) with 32 doubles, 19 home runs, 71 RBI, 70 runs scored, a .545 slugging percentage and a .378 on-base percentage in 107 games for the Fisher Cats this season while helping lead the team to an Eastern Division-best record of 71-60. The 22-year old currently leads all active Eastern League players in slugging percentage (.545) and OPS (.923) and is ranked second and third overall respectively in each category. He is also ranked among the league leaders in numerous other categories, including extra-base hits (52-tied 4th), total bases (217-5th), home runs (19-tied 5th), batting average (.317-6th), RBI (71-7th), doubles (32-8th) and runs scored (70-tied 9th). The 6'2", 195 lb. slugger has not only made strong contributions to the Fisher Cats offensively but has also been outstanding behind the plate, throwing out 26-percent of would be base stealers, which ranks as the sixth best percentage among all Eastern League catchers this season. Travis, who is a native of Long Beach, California, was selected as the catcher on the recently announced 2011 Eastern League All-Star Team. He was also the starting catcher for the Eastern Division at the 2011 Northeast Delta Dental Eastern League All-Star Game in front of his home crowd in Manchester, New Hampshire and was ranked by Baseball America as the "Best Defensive Catcher" in the Eastern League this season. d'Arnaud, who entered the season ranked by Baseball America as the fifth best prospect in the Toronto organization, was originally drafted by the Philadelphia Phillies with the 37th overall pick in the 2007 draft out of Lakewood High School in California. He became a member of the Toronto Blue Jays organization when he was included in a trade from Philadelphia as part of the package for Roy Halladay on December 16, 2009. Portland outfielder Chih-Hsien Chiang finished as the runner up in the voting for the award and Harrisburg first baseman Tyler Moore finished in third place. This award was voted on by Eastern League team managers and coaching staffs, sportswriters, radio and television broadcast personnel and other members of the media.